Although most commercial roofs are known as flat roofing systems, you’ll find that most of them have a pronounced slope. This is primarily why the terms “flat roof” and “low slope roof” are used interchangeably. But why is it important that a flat roof have a slope of any kind? And what is the significance of the pitch? We’ll aim to answer these questions and a few others below. The most obvious reason why your roof has a slope is because it has to allow water to flow off. The slope will determine how easily the roof will allow water to flow off and how well it will perform in the long run. Roofing systems with inadequate slopes will often end up having so-called low spots, which can be a nuisance as well as a very serious problem when it comes to maintaining the roof’s structural integrity. 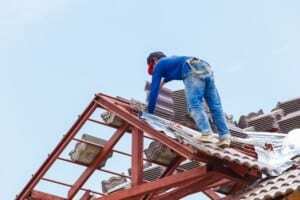 Count on expert Colorado Springs roofing company contractors to install roofing systems that provide the best structural integrity. Low spots can happen as a result of the expansion and contraction of the building during times of fluctuating temperature, or when inadequate drainage results in problems such as ponding. In such cases, knowing your roof’s pitch will help you make the right adjustments after having repaired the roof. Knowing the right pitch your flat roof should have, however, can often bypass these issues entirely. The correct pitch will prevent ponding in most cases, and it will allow the roof’s flexible qualities to take over if the building or the ground beneath it expands or contracts.